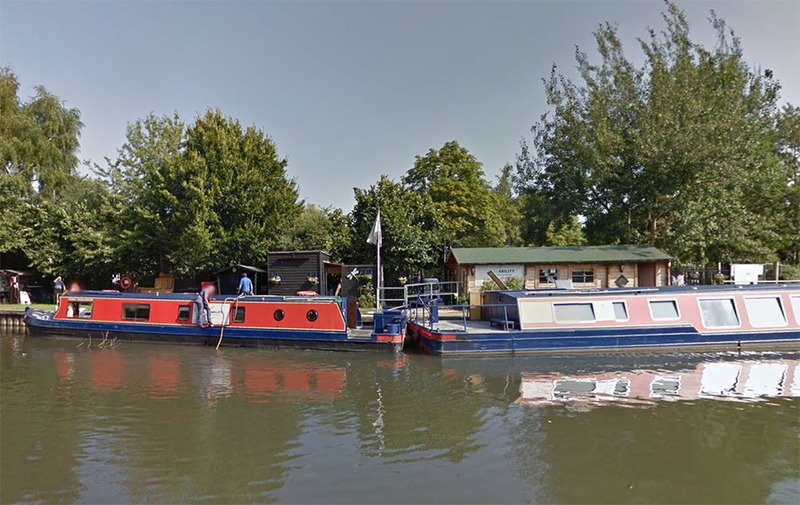 Our mooring is located on the Hertfordshire / Essex border is easily accessible by road using the M11, or by mainline rail to Harlow Town railway station. We are only 12 miles from London Stansted Airport, 35 miles from Central London and 40 miles from Cambridge. Follow the M25 to Junction 27 and take the exit onto the M11 heading north. Exit at Junction 7 – signposted A414 Chelmsford/Harlow. At the roundabout take the 4th exit onto the A414 towards Harlow/Ware. Follow the A414 for 1.4 miles and at the roundabout take the 1st exit A1025 Second Avenue. Follow the A1025 for 1.3 miles going straight over at the next two roundabouts, then at the 3rd roundabout take the 2nd exit onto A1019 Velizy Ave. Follow A1019 for 0.4 miles and continue straight over at the first roundabout onto A1019 Fifth Ave. Continue straight over the second roundabout and at the third roundabout continue straightover again (2nd exit) on to A414 Fifth Ave. Follow A414 Fifth Avenue for 0.4 miles until you reach the next roundabout (Eastwick Roundabout). Turn right taking the 2nd exit onto Eastwick Road. Follow Eastwick Road for 0.3 miles until you see the Dusty Miller public house on your right hand side. At the pub turn right onto Burntmill Lane. Follow Burntmill Lane for 0.3 miles until you see the Moorhen pub on your left hand side. Turn left into the Moorhen car park and then turn immediately right and drive to the far end of the car park where our mooring is located. Follow the M11 heading south and exit at Junction 7 – signposted A414 Chelmsford/Harlow. At the roundabout take the 4th exit onto the A414 towards Harlow/Ware. Follow the A414 for 1.4 miles and at the roundabout take the 1st exit A1025 Second Avenue. Follow the A1025 for 1.3 miles going straight over at the next two roundabouts, then at the 3rd roundabout take the 2nd exit onto A1019 Velizy Ave. Follow A1019 for 0.4 miles and continue straight over at the first roundabout onto A1019 Fifth Ave. Continue straight over the second roundabout and at the third roundabout continue straightover again (2nd exit) on to A414 Fifth Ave. Follow A414 Fifth Avenue for 0.4 miles until you reach the next roundabout (Eastwick Roundabout). Turn right taking the 2nd exit onto Eastwick Road. Follow Eastwick Road for 0.3 miles until you see the Dusty Miller public house on your right hand side. At the pub turn right onto Burntmill Lane. Follow Burntmill Lane for 0.3 miles until you see the Moorhen pub on your left hand side. Turn left into the Moorhen car park and then turn immediately right and drive to the far end of the car park where our mooring is located. Our nearest train station is Harlow Town which is situated on the main line that runs from London Liverpool St and Tottenham Hale, towards Stansted Airport and Cambridge. 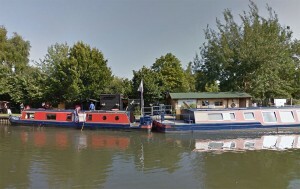 The mooring is a short 5 min taxi ride from the train station. Directions for taxi ride: Exit the station and take the 4th exit at the roundabout on to A414 Fifth Avenue. Follow the A414 for 0.4 miles until you reach the next roundabout (Eastwick Roundabout). Turn right taking the 2nd exit onto Eastwick Road. Follow Eastwick Road for 0.3 miles until you see the Dusty Miller public house on your right hand side. At the pub turn right onto Burntmill Lane. Follow Burntmill Lane for 0.3 miles until you see the Moorhen pub on your left hand side. Turn left into the Moorhen car park and then turn immediately right and drive to the far end of the car park where our mooring is located. We easily accessible from London Stansted Airport which is located just 12 miles away, approx 15 mins by car or train. We are also within an hour of the other main London airports: London City Airport – 25 miles, Luton Airport – 28 miles, London Heathrow Airport – 52 miles, London Gatwick – 63 miles. From the airport you can reach us by train or car by following the directions above.